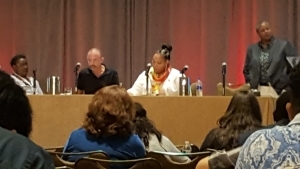 A collaboration between the National Minority AIDS Council (NMAC), the DC CFAR, and the Martin Delaney and DARE Collaboratories, produced a Master Series panel discussion on HIV Cure Research for the US Conference on AIDS (USCA) on September 6th in Orlando, FL. USCA -- one of the largest domestic, community-focused HIV/AIDS conferences -- features workshops and poster sessions on biomedical HIV prevention, gay men, leadership, people living with HIV, stigma and public policy. The panel, which was moderated by Toni Young (BELIEVE and DC CFAR CABs), included panelists Martha Cameron (DC CFAR CAB), Danielle Campbell (UCLA CFAR/DARE), Jeff Taylor (DARE/Martin Delaney/ AmFAR), Brad Jones (Martin Delaney Collaboratory/Cornell University), and Timothy Ray Brown, the only person cured of HIV. Approximately 150 people participated in the session which was divided into three parts: HIV cure and vaccine research; principles of community engagement; and ethics of cure research. Click here to learn more about the DC CFAR CAB.